Greetings. I’m happy to share with you some exciting new glass art in this month’s issue of Holsten Galleries News. 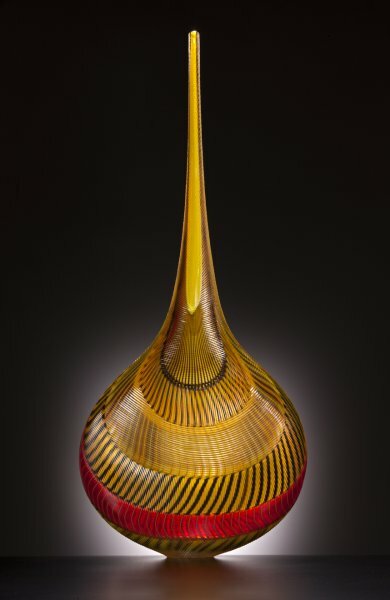 As well as featuring new works by some of my favorite artists, I am pleased to introduce to you a New Mexico glass artist whom you may not be familiar with, Peter Wright. I hope you will enjoy spending a few moments viewing these works and welcome any feedback or questions you might have. 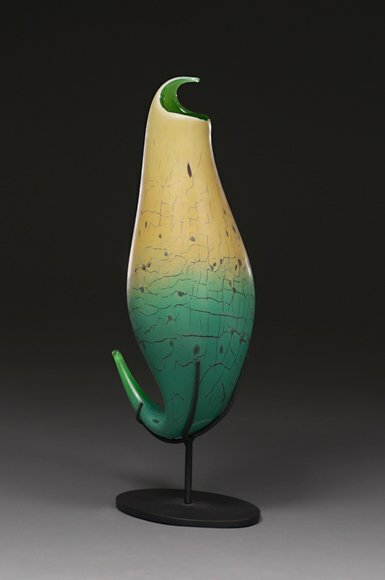 "The purpose of life is washing the dust of daily life off of our souls"
28″ x 7″ x 6"
Peter Wright has this to say about his own work: "I have been completely drawn in and seduced by hot glass. I am fascinated by the endless possibilities this material has to offer. I love working with color and surface, gesture and form." These two examples of Wright’s glass sculpture exemplify his love of form, gesture, color and surface decoration. I encourage you to take a look at some of his other creations on this new page. "Saba" is an outstanding example of the maestro’s mastery of form, cane work and surface cutting. I love this combination of colors, reminiscent of a tropical sunset or perhaps a smoldering fire. As always with Lino’s work, there is a je ne sais quois that makes it far more than the sum of its various parts. Another of my favorite New Mexico glass artists is Harry Pollitt. Pollit’s lost wax castings are among the most fluid and expressive examples of cast glass that I have come across. In "Splash," I love the fluidity of the lines and the use of negative space. This new piece by Nancy Callan is a smaller variation on her well known Cloud series. A further distinction of this dramatic piece is the artist’s deliberate linear use of short pieces of cane that tend to cross each other and suggest some sort of a grid or road map. This figurative glass sculpture by Latchezar Boyadjiev is far more literal than many of his more abstract castings. 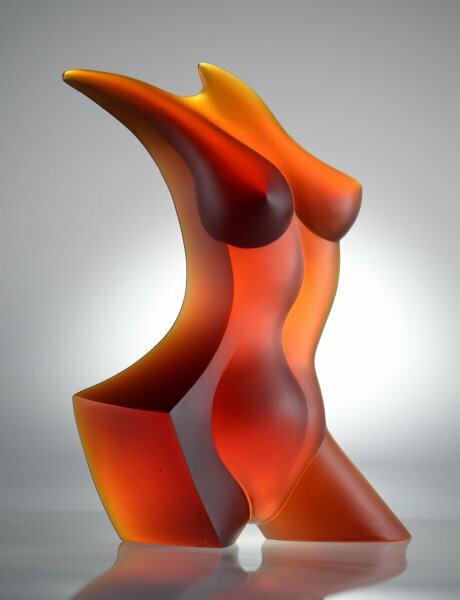 The deep, moody red/amber colors add to the expression of this artist’s passion not only for his work but also for the female form., putting him in the good company of many famous sculptors and painters throughout the ages. I hope you and your families are enjoying your summer and I look forward to staying in touch.